There ain’t no rest for the wicked, as they say and, whether you think the Predators are wicked or not is by personal opinion, Nashville hasn’t had much breathing room. After defeating the New York Rangers 3-2 yesterday afternoon, the Predators were back at it again this afternoon against the Florida Panthers in Sunrise. Very much like yesterday, the first period today was slightly uneventful with no goals for either team. Both teams were given powerplay chances, but neither goaltender was willing to let one by. The second period belonged to the Panthers, as both Tomas Fleischmann (6) and rookie Aaron Ekblad (8) would sink goals on Carter Hutton. The period would end in favor of the Panthers 2-0. Mattias Ekholm suffered an upper-body injury late in the second period after slamming into the boards. Though he was able to leave on his own, Ekholm did not return to the game after his injury. The Predators finally hit the right notes at 4:44 into the third period with a powerplay slapshot from Seth Jones. 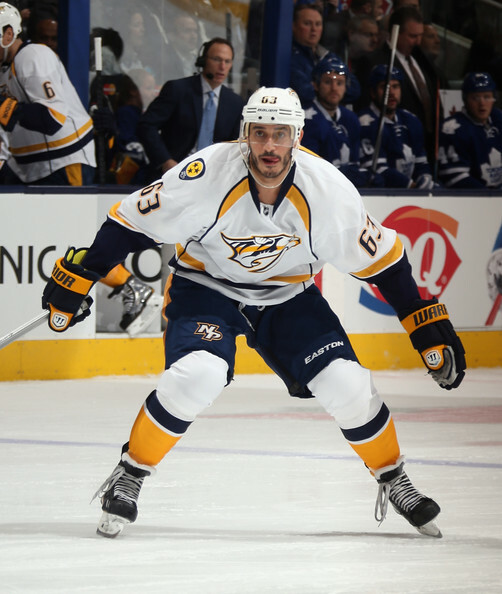 Mike Ribeiro (34) setup the assist for Jones’ fifth goal of the season. Filip Forsberg would tie the game at 15:17 on another powerplay opportunity, collecting his 18th goal of the season. No assistance was needed for Forsberg’s snapshot past Roberto Luongo. 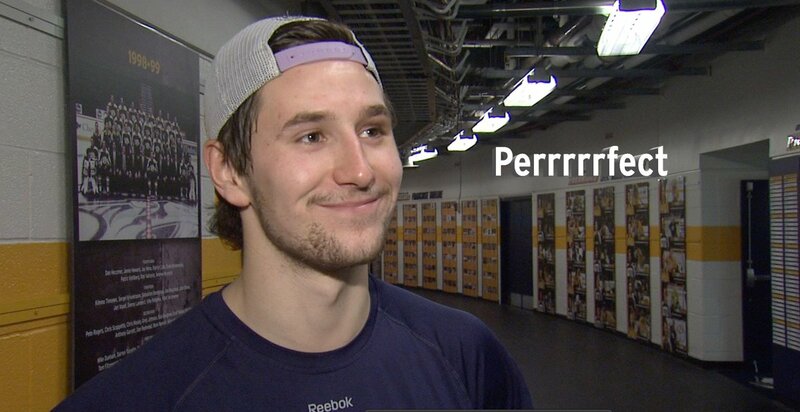 With his game-tying and game-winning goal, Filip Forsberg is all smiles – as usual. With eighteen goals, Forsberg is tied with Alexander Radulov’s rookie goal record. Colin Wilson, who is day-to-day, did not make the trip with the team to Florida – unsurprisingly. Carter Hutton is now 5-4-4 on the season and me thinks may have found his niche. It is certainly safe to say that Nashville came into Sunrise, Florida and stole two points from the Panthers. 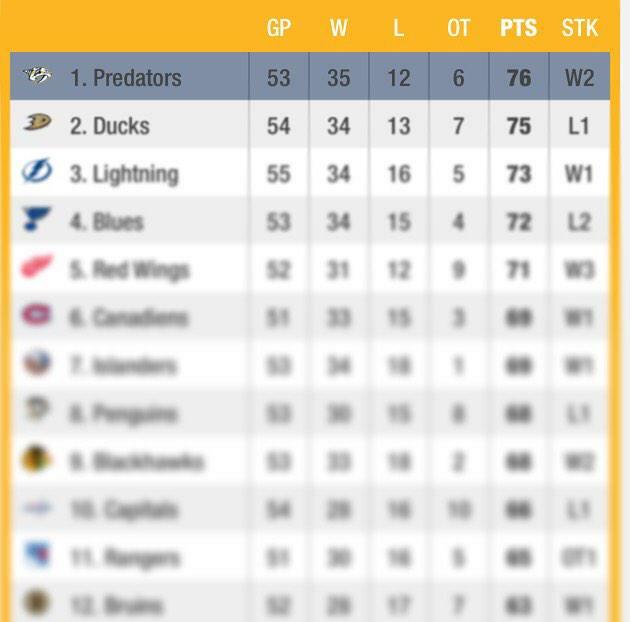 With the collection of two points, Nashville is now 35-12-6 and, thanks to the Lightning defeating the Ducks 5-1, the Predators are now back atop the League with 76 points. Kudos to the Blackhawks as well for taking a chunk out of the St. Louis Blues 4-2 (the Blues are down by four at 72 points). The Predators are back Tuesday night as they welcome the best in the Eastern Conference, the Tampa Bay Lightning. After losing the Western Conference lead to the Anaheim Ducks Thursday night, the Predators needed the boost from regulation win against the New York Rangers to regain some momentum Saturday afternoon. The Rangers, who were 30-15-4 coming into yesterday’s bout, were riding confidently on a three game winning streak & hoping to extend that to four. Without King Henrik in the net, could the Rangers pull off the win? Or would Pekka Rinne’s return hold off the Blueshirts? The first period saw plenty of pressure from both sides, but neither team could capitalize on their chances. The Rangers out-shot the Predators 10 to 8. By no surprise, the Predators welcomed back former Predator Kevin Klein with a nice tribute video. Klein, who was drafted by Nashville 37th overall in the 2003 draft, spent his entire NHL career with the Predators up until last season when he was traded to the New York Rangers for… sigh… Michael Del Zotto. You can watch the tribute video here. Thanks everyone for the love! Was pretty special being back. Thanks to the preds and fans for the tribute! 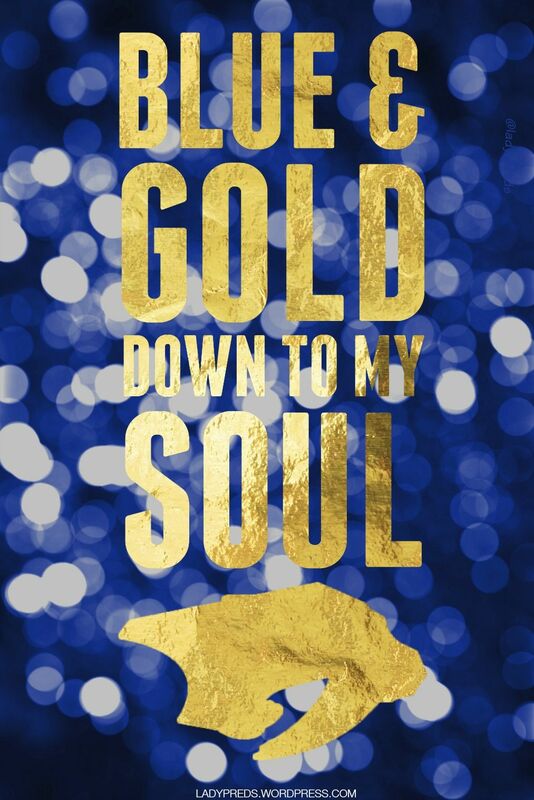 The Rangers struck gold first, capitalizing on the powerplay from Rick Nash (33) at 11:49. Roman Josi would respond at 18:39, collecting his 10th goal of the season. Gabriel Bourque (5) and Calle Jarnkrok (9) would pick up the assists. Shea Weber (12) would give Nashville the lead 2-1 at 19:20 with his signature slapshot past Cam Talbot. Roman Josi (27) and Matt Cullen (6) would notch the assists. The Rangers took to out-shooting the Predators during this period as well, this time 12 to 10. Ryan McDonagh wasted no time tying the game early into the third; his fourth goal of the season. But it was Mike Ribeiro’s seemingly angry slapshot at 12:46 that sealed the game in favor of Nashville 3-2. 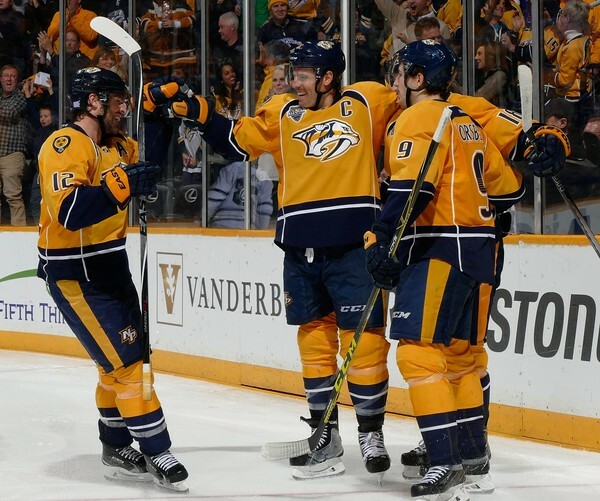 Seth Jones (14) and Filip Forsberg (30) tallied the assists on Ribeiro’s 11th goal of the season. The Rangers would – yet again – out-shoot the Predators, this time 10 to 5, but Nashville would come out as the victors. With his 11th goal of the season, Mike Ribeiro has now tallied his 700th career point. Ribeiro, who has been pretty consistent this season and lead the team in points for a good while, hasn’t had a point since January 29th against the Avalanche (picked up an assist). Chalk it up as patience towards that 700th point. Colin Wilson sustained an injury during the first period and did not return to the remainder of the match. It was later released that he is day-to-day with an upper-body injury. Filip Forsberg continues to slap the NHL with his Calder Memorial Trophy contingency as he continues to lead the Predators in points and in every category that a rookie can (minus goaltending). Forty-seven points in 52 games? Yea, you can’t ignore that. As usual, the Predators have no time to rest. Today, the team is in Sunrise, Florida to take on the 23-17-10 Panthers who are currently sitting pretty in 5th in the Atlantic Division. With Colin Wilson out, there’s a good chance Olli Jokinen will be off the scratched list and, due to being a back-to-back, Carter Hutton will start in net. Nashville lit the lamp at 6:24 to get the ball rolling; Craig Smith’s seventh goal of the season. Colin Wilson (5) and Anton Volchenkov (3) pursued the assists on Smith’s goal. The Kings were quick to put their name on the board, tying it at 11:32 with a goal from Jamie McBain (his first of the season – you’re welcome). Though both even on the scoreboard, Nashville would send twelve shots-on-goal compared to L.A.’s seven. Marian Gaborik would give L.A. the lead at just 1:01 into the second, his fourth goal of the season. Not even a minute later, Eric Nystrom would tip one in from Taylor Beck (3) and give Nashville a 3-2 lead late in the second. Shea Weber also picked up an assist on Nystrom’s goal, his seventh of the season and – remember when I said he’d have another reason to be happy? – is now the franchise defenseman leader in assists with 223. Just 38 seconds into the third period, Drew Doughty would sink a clean goal through Pekka Rinne’s five-hole, tying the game. Though Nashville did everything right to push back into the lead (with a number of nail-biting dings off the post and floating pucks), Martin Jones kept his composure and helped send the game into overtime. It was clear Nashville was in control during overtime, out-shooting the Kings four to one and keeping Jones on his toes. Unfortunately, no goals were tallied in overtime, thus throwing Nashville into its second-straight shootout. Phew! For a second there, I thought we were going to have to go through the entire roster and then some! Both goaltenders, Rine and Jones, were on point and one was going to have to budge sooner or later. 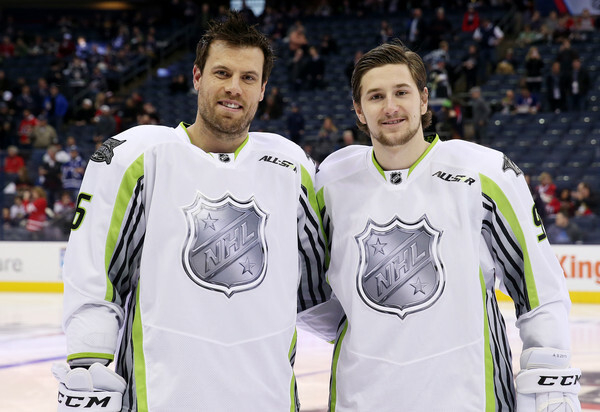 Unfortunately for Los Angeles, it was Martin Jones who cracked first, a kid who only moved up into the NHL from a stint in the AHL last season. However, the kid is good – when others would flinch under the sight of a Shea Weber cannon, Jones stood tall. With this SO win (and St. Louis’ loss in a shootout against the Senators), the Predators are back atop the Central Division, but St. Louis is still biting Nashville’s heels. The Predators are back in action tomorrow night for a Turkey Day throw-down with our friends from the North, the Edmonton Oilers. The Oilers, who have lost their last five games and are sitting dead at the bottom of the Pacific Division, will be another possible “Florida Panthers scenario” if the Preds don’t mind their p’s and q’s. By assuming Nashville will overpower and kick the Oilers to the curb is as inaccurate as they come. The Oilers are due and win and punting Nashville on an American holiday is just what the doctor ordered.